First of the Season Junco! Just a quick phonology note here. The bird banders at the Lee & Rose Warner Nature Center caught the first-of-the-season Slate-colored Dark-eyed Junco while banding this morning. For those not in the know, these birds are also called the "snow birds" as they are the harbingers of winter. 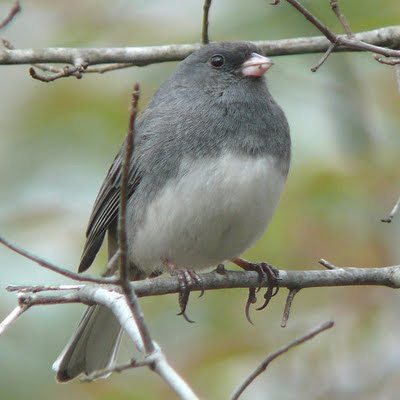 When the Juncos arrive from their breeding grounds to the north, you can be sure winter and snow are not far behind. With today's driving wind and a high temperature in the mid-fifties that isn't too hard to imagine. This is early for Juncos though. I usually don't see them in any numbers until mid-October.